Twirling is so much fun especially when your wearing a Vintage Prom Dress! 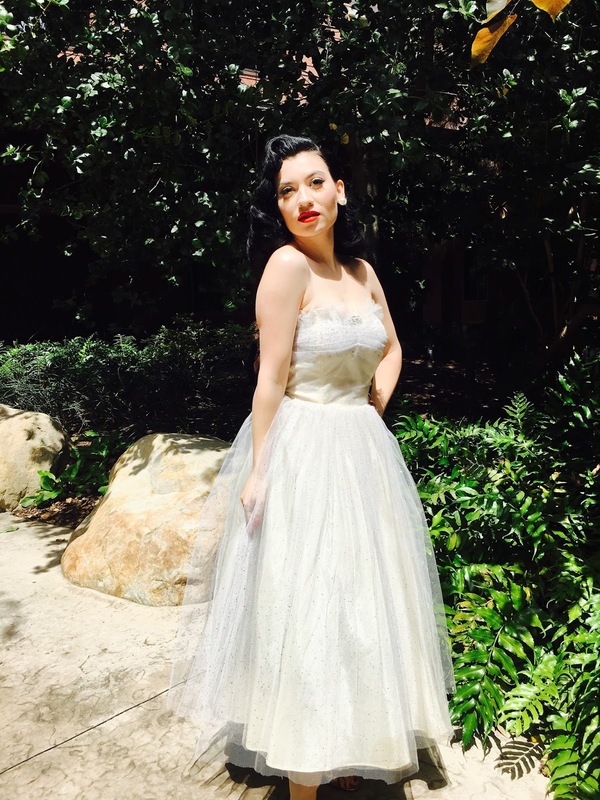 I finally made it to Dapper Day, it was my first time attending the Expo so of course I had to look Glamorous, & I needed a gorgeous hair style to match my Vintage 50's Prom Dress. So of course I went to my go to Hair Dresser who specializes in the art of Vintage Hair Styling Missy also known on Instagram as TechnicolorCutie. I asked for Dita's Signature Pageboy Hair Style, it is by far one of my favorite hair styles & I feel that it suites my face shape pretty well. 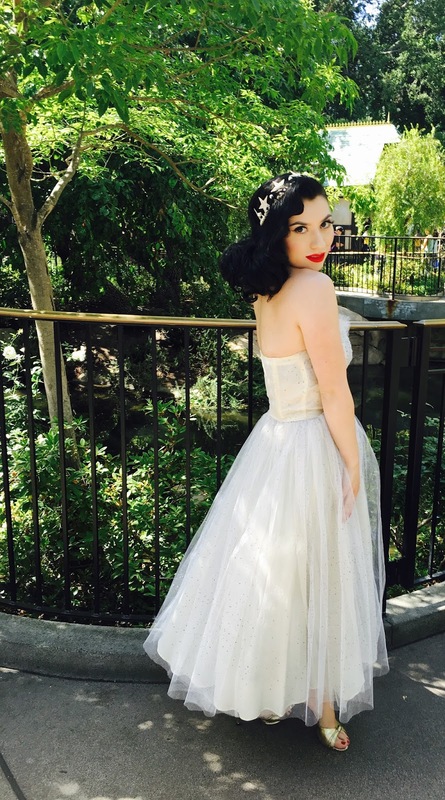 Old Hollywood Glamour is my esthetic & I am an Artist who loves a good Iconic Red Lip. I always go for that Marilyn type of seductive eye make up. 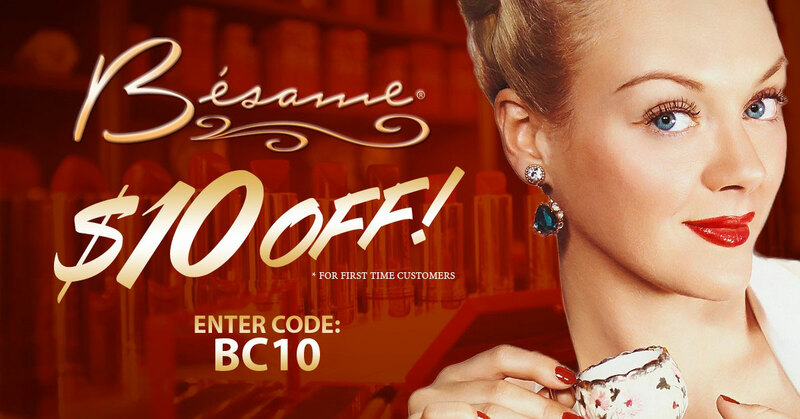 So I used Besame Cosmetic's "Cake Mascara" to wing out my bottom lash line giving that eyelash shadow. 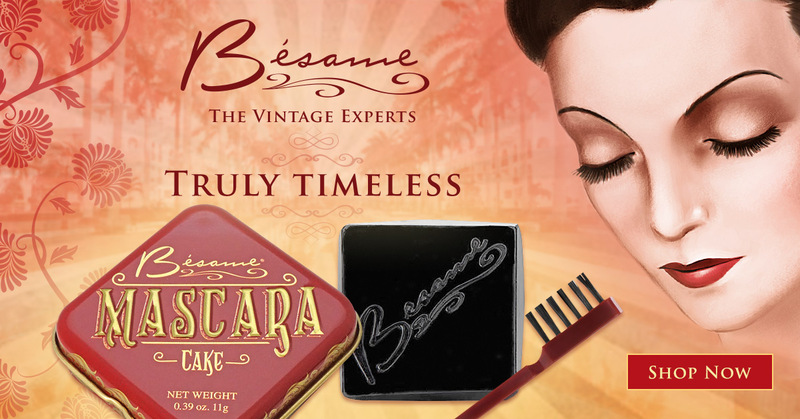 Their Cake Mascara is a beautiful recreation of the original 1920's Black Cake Mascara that would come in this beautiful charcoal coal shade that they would use as eyeliner or mascara. My Foundation is their velvety matte "Cashmere Powder Foundation" in shade Porcelain, its one of my most used products from them. I always use their "Vanilla Brightening Powder" to brighten up under my eyes, I also focus on the T Zone & of course the Chin to bring light to the parts of my face I want to bring attention to. 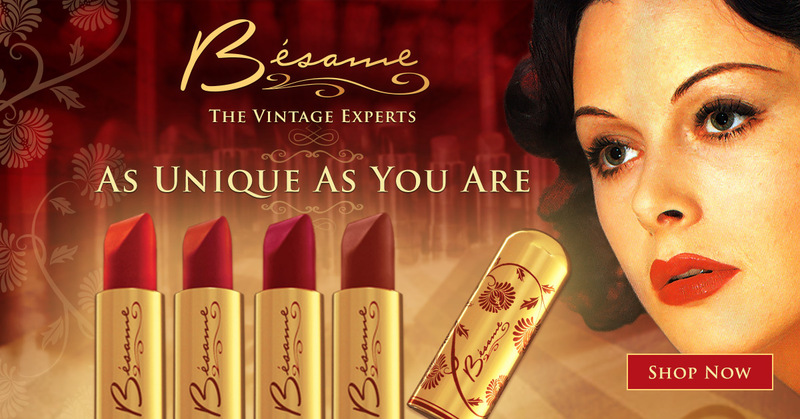 Now to finish my look I apply my favorite classic blue toned shade of red "Besame Red" it's a beautiful 1920's inspired shade that Hollywood Starlets loved. 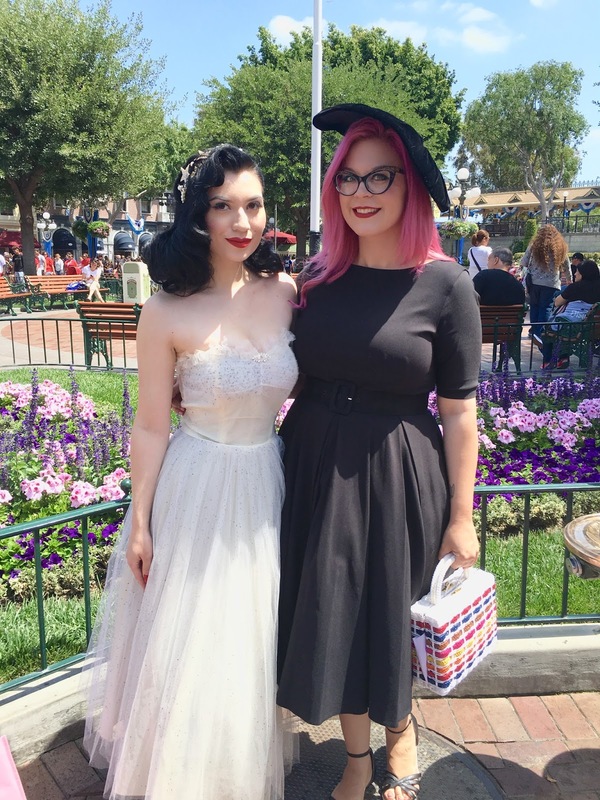 Here I am with my Insta Gal Pal Loni she was showing love for Dapper Day & Bat's Day! 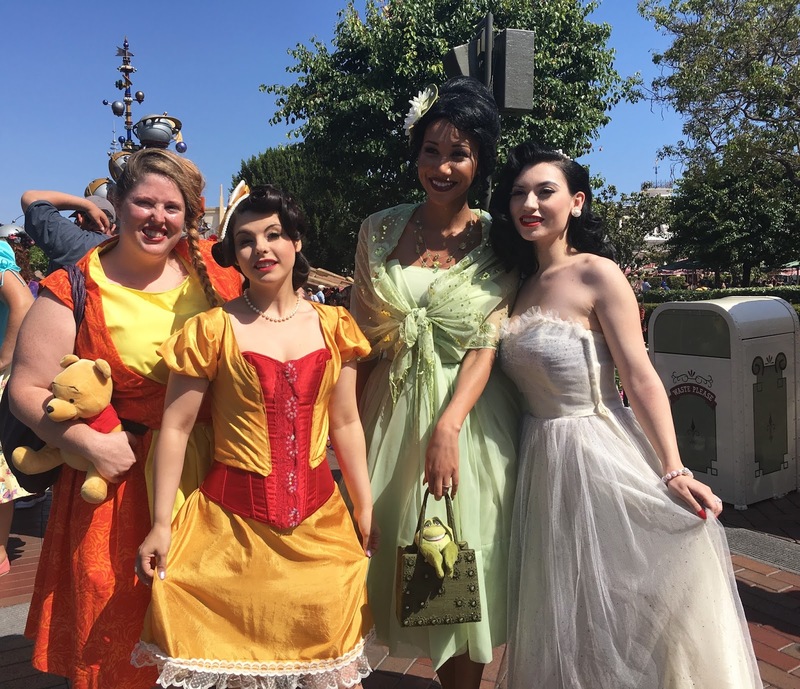 I finally met another gal pal from Instagram the lovely Miss Lady Damfino who's known for her amazing Disney Cosplay's especially her Snow White one! Group Photo with Amber Arden another Famous Cosplayer known for creating the Disney Fett's based off of the Famous Classic Star Wars character Boba Fett. On Our Way to the Dapper Day Expo, with my wonderful husband! The Expo was a wonderful Dapper Experience, I finally had a chance to shop & meet with some lovely people. Of course I couldn't just attend the Expo without buying something I ended up buying two pairs of Vintage Slingback's! I also bought a Dapper Day Spring Pin to add to my Disney Pin Collection hehe! Pin Up Girl's Booth at the Expo! I couldn't have been more excited when I met one of my favorite Pin Up Girl Gal's the beautiful & super nice Miss DorisMayDay. She was so wonderful to chat with & her boyfriend Daniel is very kind it was great to chit chat with both of them, & I look forward to visiting the Pin Up Boutique to visit her again. The Booth was beautiful with it's stunning artwork inspired by the work of MaryBlair, they had so many lovely gals working the booth, I ended up purchasing some left over items from the Famous Pin Up Yard Sale! I scored the Deadly Dames Red Twill Cigarette Trousers, Pin Up Couture White Peasant Top, & the Restocked PUG Unicorn 1940's Classic Harlequin Novelty Print & this last run of the iconic vintage print circle skirt came with pockets. Posing in the Faux Fur Betty's Blonde Boa! 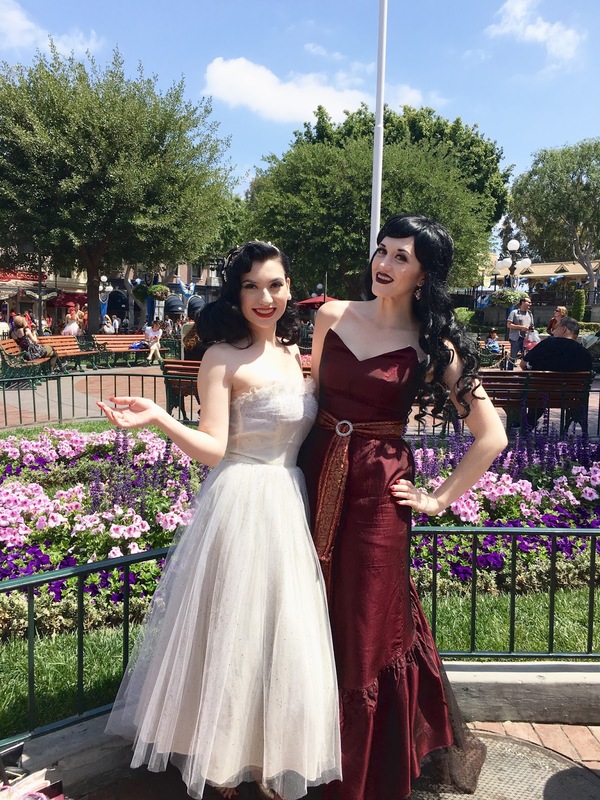 Two of my favorite Vintage Loving Glamour Gals! They are truly two inspiring women & being able to mingle with them about vintage & old hollywood glamour was truly a wonderful experience. Their accessory line is full of Starlet Inspired Jewels, Faux Fur's, & HandBags exquisite designs to say the least. Tara & Ashlyn have so much knowledge about our Iconic Hollywood Starlets that each product on their website has a Vintage History lesson for you to learn about the product you may be purchasing. 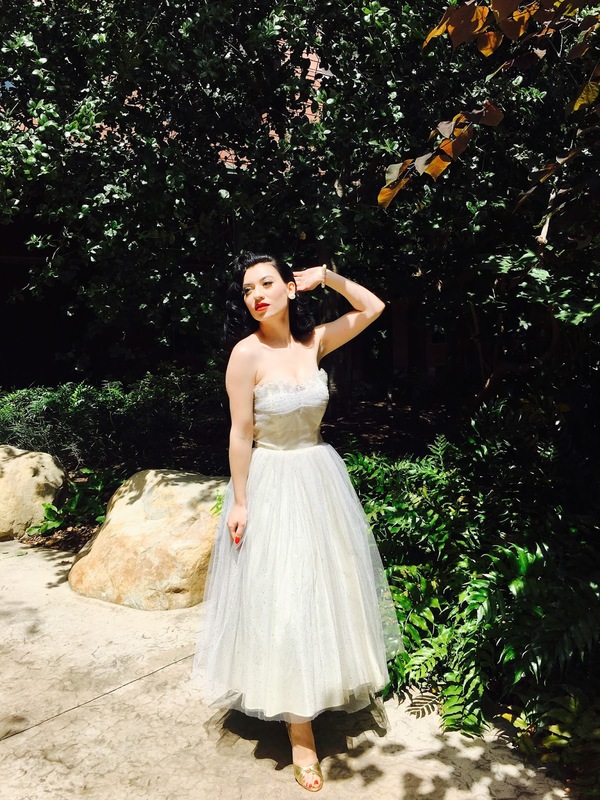 I have been saving this glamorous 1950's Vintage Prom Dress for the perfect event! So I was glad to finally wear it out for all to see, I bought it from a Vintage Etsy Seller, who was selling it for a great price & it's glitter confetti splatter was to good to pass up. It has a tulle over skirt with a satin fabric underneath & a built in bodice to give you that cinched hour glass shape. 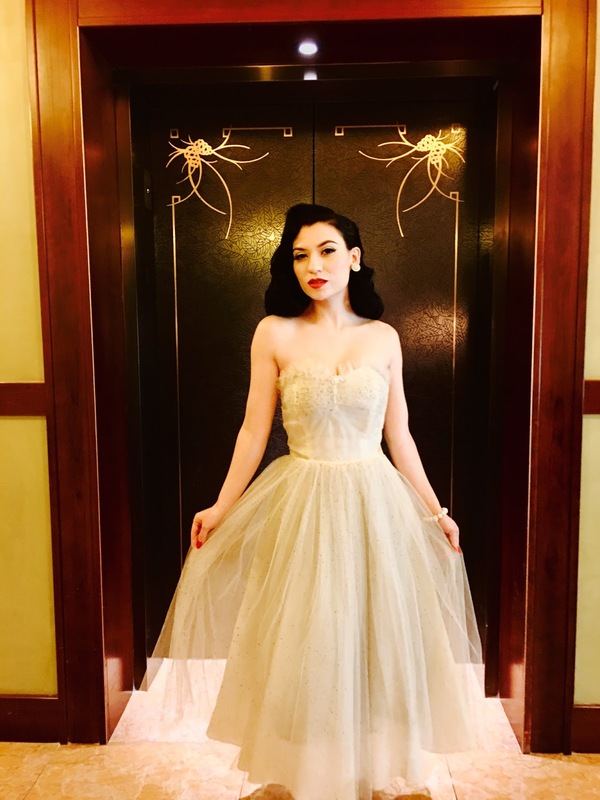 I paired it with my Vintage 1940's Gold Lame Springolator's, my Bombshell Shoe Clip placed on the center on my sweet heart prom dress, Some Chiffon Pink Pearls & my Vintage Clip On Pearl Earrings. As seen below I bought the beautiful Factor's Follies Crown from my visit at ThePinkCollarLife Booth. 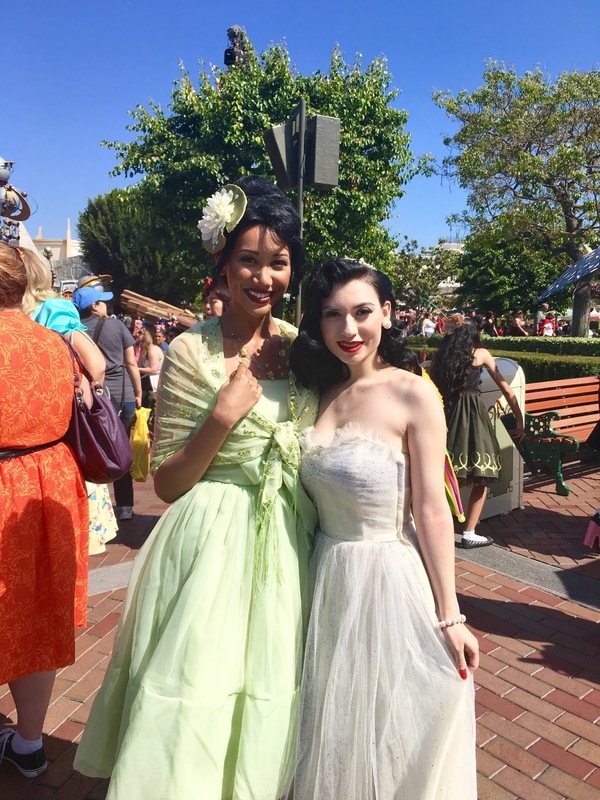 To Finish this Dapper Post here is a mini Video of my PageBoy Hair Style & Vintage Glamour Girl Make Up for my time at Dapper Day's Spring Outing at Disneyland. 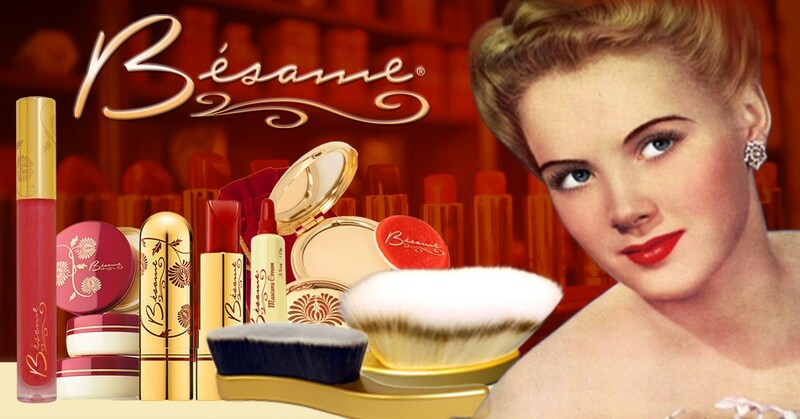 Vanilla Brightening Powder, Porcelain Cashmere Rose Gold Compact, 1920's Cake Mascara, & Besame Red Lipstick all from Besame Cosmetics. Click the Banner Below to Shop MissVintageLady's Favorite Vintage Inspired Brand & To Receive your Discount Code! Oh my! Thank You! I just went & read your post thank you for featuring me! I actually have your blog book marked on my computer, I truly enjoy your blog. Just beautiful...almost like being there! Pink Grapefruit & Summer Fun! !